What is Aviary Beauty & Wellness Collective? Aviary is a collective of beauty and wellness professionals bound together by our love and passion for offering great services while using effective and natural products. Our intention is to create a nurturing and relaxed environment for our clients and staff. 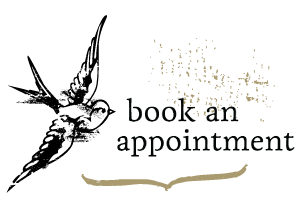 You won’t feel rushed in and out like some busy, fast paced salon environments; we are focused on individualized care for each client. Our 1100 square foot loft is located inside the Studioplex community, a repurposed cotton storage facility in Historic Old Fourth Ward, Atlanta, Georgia. If this is your first visit, please arrive ten minutes prior to your scheduled time of service. This allows us time for a consultation and to fill out any paperwork associated with your service. We understand that unexpected circumstances occur in life. If you must cancel or reschedule your appointment, we require 48 hours notice be given. Because we frequently run on a Wait List, this gives us ample time to re-book openings that result from a cancellation. Rescheduled appointments within the 48 hours time frame will require a $35 rebooking fee. Any service cancelled in less than the minimum required time frame will be charged 50% of the full cost of service. No shows will be charged 100% of the minimum service fee. If you are running late, please let us know; we will try to accommodate you when possible. Anyone arriving more than ten (10) minutes after their scheduled time may expect to have his or her time cut short but will be charged for the full cost of service. When I get to Studioplex, where should I park? At Studioplex, we have a paid parking lot and deck. Enter the main gate of Studioplex and keep driving until you take a right into the parking deck. Unreserved spaces are on the ground floor to the right and upstairs levels 3 and above. Free parking exists outside of the building alongside any of the city streets on the perimeter of Studioplex Lofts. Yes! Gift certificates are available for any service or dollar amount. We have physical cards that may be picked up at the time of purchase or we can email it. Gift certificates are non-transferable, not redeemable for cash and may not be replaced if lost or stolen. Click here to purchase. We accept Visa, MasterCard, Discover and American Express and Cash and Personal checks.. Returned checks are subject to a $30 fee. Our prices do not include gratuity. We are always delighted to receive gratitude in any form, as it lets us know that our clients appreciate our hard work and personal environment. Gratuities are always at the discretion of the client and are never expected. Is it OK for me to bring my child or pet? We love children but they are sometimes unable to keep quiet in our spa-like environment therefore we request that children only accompany you to the salon if they are receiving a service. Children under 13 should be accompanied by an adult. We love animals but law does not permit them in a salon or spa facility. Do I need to let you know of any allergies, medications or surgeries? Yes. It is up to you to notify your therapist or stylist when booking an appointment about any physical ailments, medical conditions or allergies. This includes pregnancy, heart conditions or pacemakers, allergies to anything synthetic or in nature. It is also imperative to notify us of any changes in medication or conditions since your last appointment. The services offered at the Aviary are not a substitute for medical care, and any information provided by is for educational purposes only and not diagnostically prescriptive in nature. The information is provided to aid the therapist in giving better service and is completely confidential. We regret that our skin therapists can not work on clients with broken bones or sprains, cancer (unless with a doctor’s approval), abrasions, open wounds or rashes that may be contagious. What is so great about your products? And what is the deal with your hair color? We offer organic hair color by OWAY. OWAY is the world’s first-ever color and styling line with certified biodynamic, organic ingredients grow on 50SQm of chemical free farmland in Bologna, Italy. Made with pure essential oils and micronized botanicals, OWAY products are free from ammonia, SLS, parabens, PEGS/PPGS, mineral oils, synthetic fragrance and are never tested on animals. We seek out conscious and sustainable beauty brands with creators who share our passion for clean, effective skin care. We believe in partnering with independent beauty brands that are emerging in the market. We aim to create a foundation of products that are available here at all times while also trying out new products as they become available on the market. I know that I want to book a service, but I am not sure which facial / massage / hair service is the best for me. We understand the decision can be overwhelming when looking at our menu of services! That is why consultations are available anytime and included free of charge with any service. You may also call us with any questions. What if I don't see my question answered here? The only bad question is an unanswered one! If you feel that we’ve left something out, please email us at info@aviarybeauty.com.